SAN DIEGO, Calif. (CBS 8) - This week's killer whale attack at SeaWorld Orlando wasn't the first time one of the marine parks has had to deal with a tragedy. According to records, there have been several incidents of killer whales injuring their trainers at SeaWorld San Diego over the years. Anne Godsey will never forget the day April 20, 1971. The secretary at Sea World here in San Diego was asked to ride Shamu for a promotional event. Suddenly Shamu threw her down and grabbed her. Godsey says she told the killer whale it could have her leg, but she wasn't going with it. "I was holding on to that wall with white knuckles. There was no way I was going to let go," she said. What happened to Godsey is the first known attack by a killer whale at Sea World, but by no means the last. In 1987, trainer John Sillick was riding Corky at Sea World San Diego when another whale crashed down on top of him. Sillick fractured several ribs, his pelvis, and his femur. The show continued while rescuers worked on him along the side of the stage. In 2006 still pictures captured another scary moment at our Sea World when Shamu grabbed trainer Ken Peter's foot and refused to let him go. 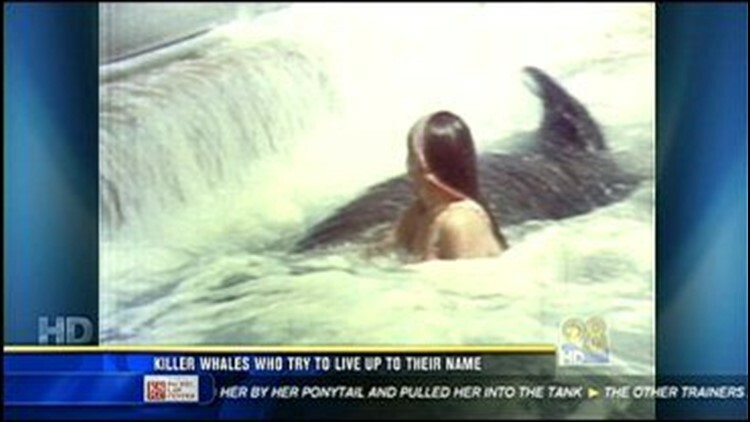 Other incidents include a 1984 attack when a whale named Kandu took two trainers in her mouth and would not release them. In 1986 that same whale pinned a trainer against a wall. And in 1987 a trainer was grabbed by two whales and dragged across the pool. It's still not clear what set Tillikum off, but yesterday's incident in Florida is a reminder to all of us that these are wild animals. "My heart just sank and my sympathy goes out to this family that, how devastating this is, because I know how devastating it is," Godsey said. Godsey ended up with 200 stitches from the waist down. There have been more than 10 incidents of whales turning violent on humans at Sea World San Diego, but there have been no fatalities.